Today, in Part 2 of our series on the special issue of medical journal Pediatrics on fragile X, we'll recap what children's doctors need to know about the fragile X premutation. 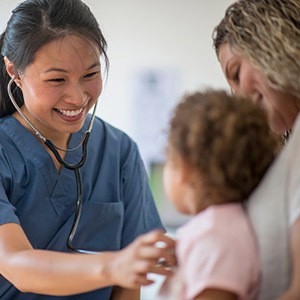 Pediatricians and other health care professionals need to know that a variety of changes can happen in the gene that causes FXS. Some individuals are carriers of FXS, also known as the premutation (PM). Having the PM means a child has fewer changes in the gene than a child with FXS, but more changes than a typical child. A child with the PM still has a chance of having FX-related problems. In an earlier blog post, we talked about how individuals with the PM are at risk for medical and emotional problems. Because of the chance that a child with the PM will have FX-related issues, doctors need to know how to detect, prevent, and treat these conditions. We know that more children have the PM than have FXS. We think it could be as high as 7 out of every 1,000 children. Even with our most cautious guess, it's still around 2 out of every 1,000. So, it's possible that children's doctors will see at least a few patients with the PM, which makes it vital for them to know about. In this article, Drs. Anne Wheeler and Melissa Raspa of OFXW, as well as Drs. Randi Hagerman, Marsha Mailick, and Catharine Riley, summarized our current knowledge on the PM. They looked at what we know about the developmental, mental health, and medical needs of people with the PM. To reach these insights, they looked at over 100 recent research studies. Children and teens with the PM are more likely to have intellectual and mental health issues such as anxiety, ADHD, and ASD. Women with the PM are also more likely to have reproductive issues even if they do not have a loss of normal function in the ovaries before age 40, known as FX-associated premature ovarian insufficiency (FXPOI). So, it's important for children's doctors to talk with families and patients about what this could mean for family planning when they grow up. Parents of children with the PM are likely to have the PM themselves. Adding to the stress of caring for their children, they may also be caring for other family members affected by the gene. Telling a child about their PM status can be a sensitive matter. Although this decision is up to the family, doctors can help children cope with and understand their PM status. Finding a child in the family who has the PM means that the gene may affect others in the family. Children's doctors should be aware of the challenge of telling and testing other family members. Many people don't know they have the PM. Children's doctors should be aware of this and help detect and keep an eye on the PM in children and families. To learn more, read the full article in Pediatrics. Earlier this week, we covered what children's doctors need to know about FXS in Part 1 of our series on the Pediatrics special issue on FXS. Check it out if you missed it! Other topics that OFXW research wrote about for the special issue include newborn screening. Check our blog later this month, when we'll give an update on how OFXW is building awareness of FX through newborn screening. What do you think is important for children's doctors to understand about the FX premutation? How has your child's doctor helped support you and your family? Please consider sharing your story with us. We hope to hear from you! If your family is affected by fragile X, please consider signing up for our research registry, where you can hear about upcoming studies and learn how you can take part.